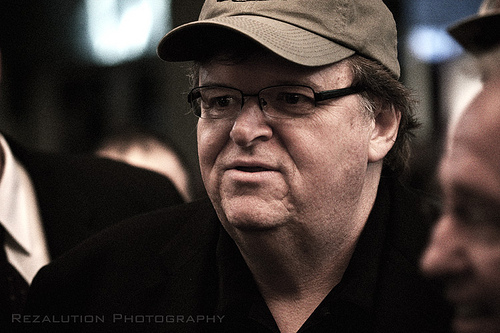 After finishing Fahrenheit 9/11 in 20004, Michael Moore still had no US distributor. He sought out Harry Weinstein at Miramax, which is owned by Disney. Weinstein agreed to back the movie, but he needed the approval of his superiors at Disney. The CEO of Disney, Michael Eisner, vetoed the distribution of the film. Miramax still held the rights to Fahrenheit 9/11, but could not distribute it. By the time Michael Eisner vetoed the distribution of the film, Miramax had already given Michael Moore $6 million. This was to be bridge financing that Miramax would recover when the film’s distribution rights were sold. The $6 million more than covered the costs of making Fahrenheit 9/11. Moore hardly had any expenditure for the film. No one but himself was paid a salary and much of the footage he obtained at little or no cost from film libraries. After seeing a rough cut of the film, Weinstein asked Eisner to reconsider his decision. After getting a report on the content, Eisner declared that Disney would not change its position on distributing the movie. Moore wanted to get his movie into theaters as soon as possible because the presidential election was in full swing. Moore decided to say that Disney was censoring the movie. This created a stir, including a front page article in the New York Times. At Cannes, Moore won the prestigious Palme d’Or award, not to mention free publicity that would be the envy of any Hollywood movie. Disney now found itself in a quandary. With Fahrenheit 9/11 standing to make a fortune, Disney, who still owned the rights through its subsidiary Miramax, had to decide who would make the profit. Eisner’s strategy was brilliant. On paper, Weinstein bought back the rights from Miramax, but then transferred those rights to a Disney corporate front. That company then outsourced the documentary’s theatrical and video distribution rights. Fahrenheit 9/11, now a media sensation, raked in over $228 million in worldwide sales, a documentary record, and over $3 million in DVD sales. An additional $30 million was brought in by royalties. After all expenses were deducted, Disney’s net profit was $78 million. Disney then had to pay Michael Moore. Documentaries usually do not make a profit, but Fahrenheit 9/11 made a stunning $21 million. Disney, after repaying itself $11 million for costs, had a net profit of $46 million, which it split between the Disney Foundation and Miramax. While it made a profit, the trouble caused by Fahrenheit 9/11 caused Disney to question its relationship with Harvey Weinstein. Disney decided not to renew the Weinsteins’ contract in 2005. Miramax belonged to Disney, but a subsidiary, Dimension Films, belonged to the Weinstein brothers. Eisner wanted to keep Dimension Films at Disney, so he had to negotiate an exit contract with the Weinsteins. Hollywood lawyer Bertram Fields got Harvey and his brother, Bob, a $130 million dollar settlement. The brothers were now able to create a new film company they named The Weinstein Company. Sergeo Kozak heads Marketing and Communications at Edictive. He writes on creative project management industry.